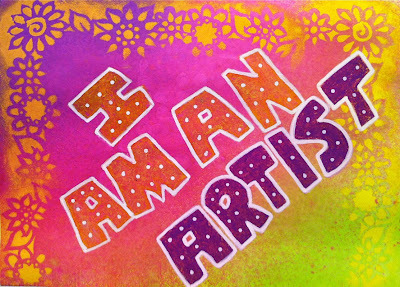 Donna's Crafty Place: I am an artist? I'm not sure I would call myself an artist. But, Dyan Reaveley says if we make art journal pages we are artists! My brother got all the artistic and musical ability in my family. He can draw amazingly well and can stun people when he sits down and plays Mozart on the piano. Me - not so much. And of course, he spends all his time at a swimming pool! I wish he could just give me little of his artistic ability, but I guess it doesn't work that way. Anyway, I'm on a Facebook group called Art Journaling for Women. Dyan Reaveley is very active in the group and she made a journal page that said I Am An Artist. And, I think other people started posting pages that said I Am An Artist. So she asked us to make pages that say that and e-mail them to her and she is going to blog about them. So, I didn't have a lot of time to make this very intricate, but I made this page today. For the background I used Dylusions Spray Inks in Bubblegum Pink, Purple, and Lime and a Dylusions stencil with acrylic ink for the border. I drew the letters with oil pastels and outlined them with a Sharpie Paint Pen. Once again, it was fun and relaxing page to make. Thanks for stopping by!! i love seeing your journal pages, each one is so unique and gorgeous. it's great to see everything you've created with this medium! Totally funky! 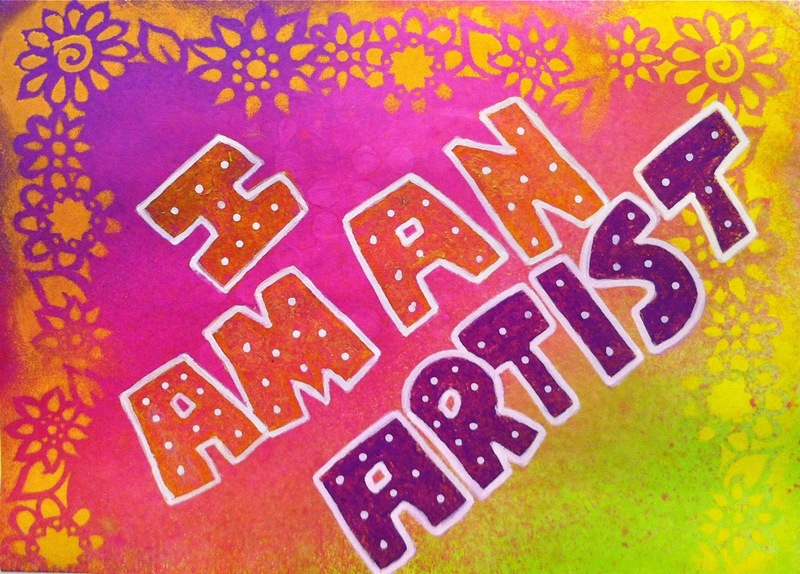 Love the colours and of course that wonderful sentiment... you definitely are an artist!